For the past month, Green Light has had the pleasure of hosting a team of six AmeriCorps NCCCs, more than doubling our workforce! As a small nonprofit, we really rely on volunteers to get things done, so having this team for four weeks has helped us get out and moving in the community on a much larger scale. We have been able to install lightbulbs in 85 homes, making a carbon reduction of 590,040LBs. The 1300+ lightbulbs the NCCC team installed will also save the recipients about $60,000 in the lifetime of the bulb, so it’s safe to say they’ve made a pretty grand impact in the short time we had them. They have also helped us get to more people on the waiting lists for gardens, and especially rain barrels, much more efficiently. Which, is great news for all our residents- so if you’ve been waiting for your rain barrel or garden, you won’t have to be patient much longer! 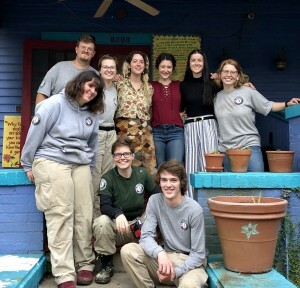 The AmeriCorps NCCC Coast 2 team has been a huge help in increasing our capacity to get our sustainable programs into homes, so thank you for all of your hard work guys!